Those of you driving petrol cars, here’s some news to cheer about. Petrol prices have been reduced across the country by up to Rs. 3 on average. In Delhi, petrol priced have been reduced by Rs. 2.64, now selling at Rs. 67.78 per litre. Falling crude oil prices in the international market have led to this latest downward revision in prices. 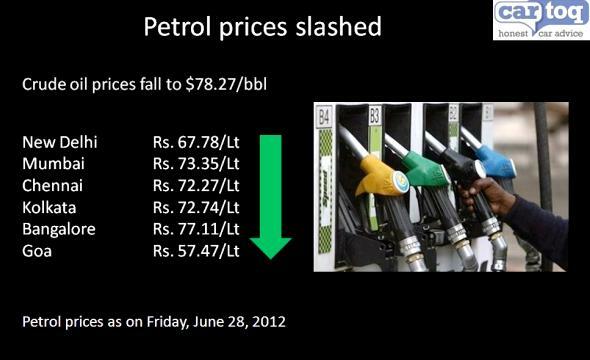 However, a declining rupee has limited the extent to which petrol prices could be cut in India. International oil prices have fallen considerably in the first fortnight of June, and now hover at $78.27 per barrel, down from close to $115 a barrel a couple of months ago. This can allow a further cut in the second week of July. Bangalore continues to have the highest price per litre of petrol in the country, now at Rs. 77.11 per litre. Goa has the lowest price of petrol in the country at Rs. 57.47 per litre. There is no reduction in price of diesel, LPG or CNG.